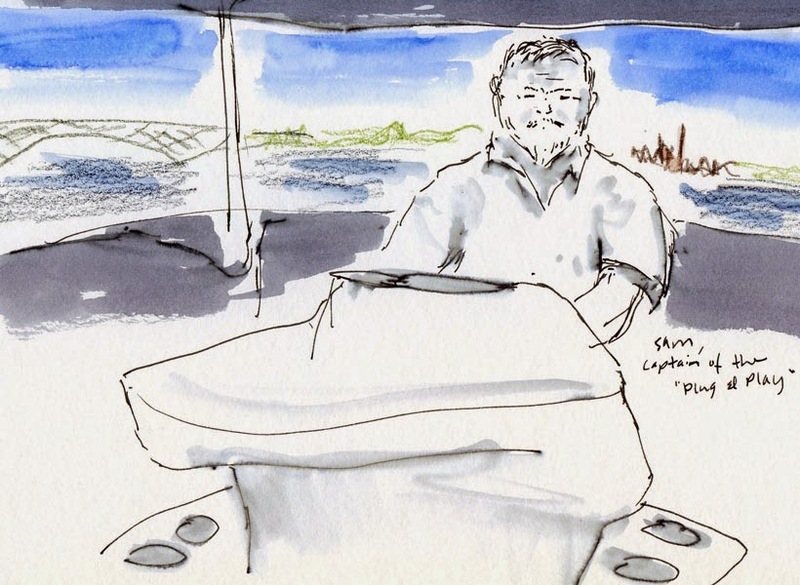 Summer is back on, and the Friday sketchers celebrated with a special treat: Sketching on and around the Lake Union house boat of Mary Lou and Sam, who generously opened their floating home to us. Choosing my first subject was easy: I climbed all the way up to the rooftop deck (stepping very carefully on that last spiral staircase!) 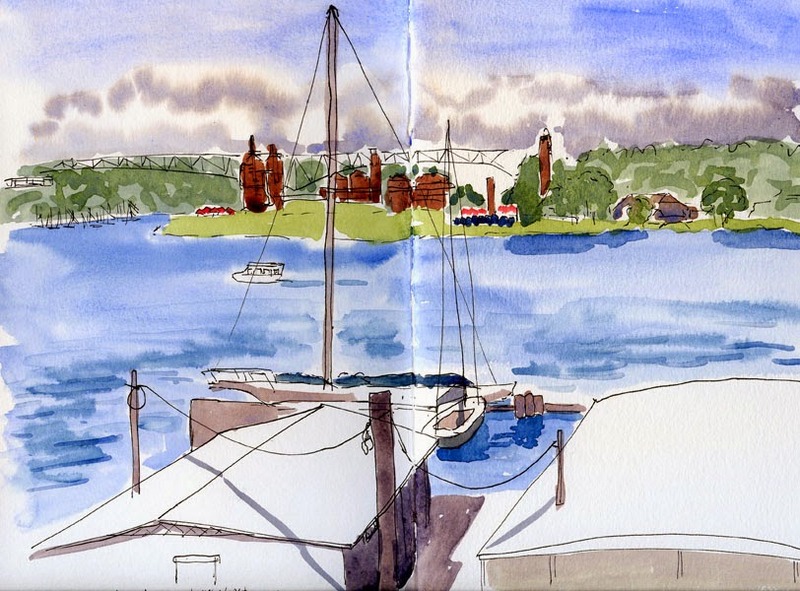 to sketch Lake Union with the Aurora Bridge and Gas Works Park in the background. The second sketch subject was harder to pinpoint. First I wandered around the three levels of their home, looking through all the many windows. Then I went outside and walked around all the surrounding docks, peeking at the views between the boats and marveling at the magical romance of living on the water. (Yes, we spotted the house boat from Sleepless in Seattle just a short distance away!) 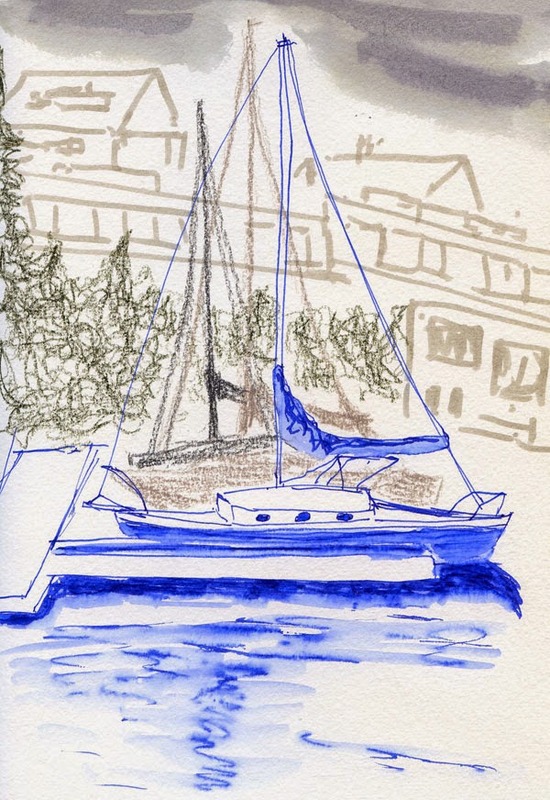 Suddenly I realized I had only about 15 minutes before the meeting time, so I quickly sketched a couple of boats in front of me. It was hard to beat sketching from a house boat, but then Sam gave a few lingerers an even better treat: A ride around Lake Union on their Lear boat! He showed us how the top rises to reveal a roomy cabin (certainly roomy enough for more than the five sketchers who hopped in when he offered the ride) and then acts as sun shelter, so we could cruise the lake in comfort. I couldn’t resist sketching Captain Sam at the wheel of the Plug ‘n Play. Thank you, Sam and Mary Lou, for opening your home to us, and thanks to Peggy for initiating the opportunity!